India has always contributed its part to provide the world with better facilities and to make it a better place for all. In past, most of the Inventions have come from the students creative minds and really changed the perception of many things. Invention develops the positive thinking and Inspires to children who want to achieve a great goal in life. Usually water is purified using water purifiers and with other available methods. But, have you ever heard of cleaning water with Corn Cobs? Yes, this new Innovative method was discovered by a teenage girl at Odisha in India. Prasida observed that corn cobs have a facility of absorbing the contaminants like salt oxides, detergent, suspended particles, coloured dyes, oil, grease and even some heavy metals. 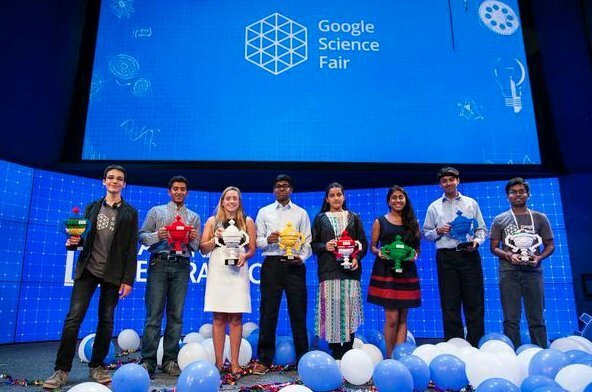 A 13-year-old student from Odisha, Sripada Srisai Lalita Prasida, has won the Community Impact Award at the Google Science Fair in the 13-15 years age category for developing a water purifier that works using waste corn cobs. Prasida, who studies in class 9 at DPS Damanjodi in Odisha's Koratpur district, was awarded $10,000 as prize money and will be mentored by Google to build the project. Odisha's Sripada Srisai Lalita Prasida won a $10,000 award at Google Science Fair for developing a way to purify domestic and industrial waste water using corn cobs. The process is simple as shown in the above sketch, each bottle contains pieces of dried corn cob of different sizes. As water pours into the top bottle and trickles down, specific contaminates are "caught" by the corn. Bottle 1: Whole pieces of corn cob catch particles visible to the naked eye. Bottle 2: Corn cobs cut into one-inch pieces trap smaller grains. Bottle 3: Corn cobs powdered into granular form absorb gasoline and oil. Bottle 4: Corn cobs burned into a blackened charcoal-like material soak up color dyes and lead. Bottle 5: The catch-all, sand, grabbed remaining chemical toxins, both organic and inorganic. As part of the project, Prasida used waste corn cobs in order to clean purify water from domestic as well as industrial wastes by applying the principle of adsorption. 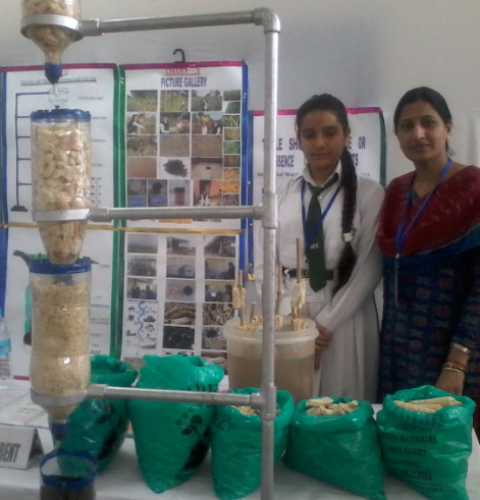 In her experiment, Prasida found that waste corn cobs are able to adsorb contaminants like salt oxides, detergent, suspended particles, coloured dyes, oil, grease and even some heavy metals. 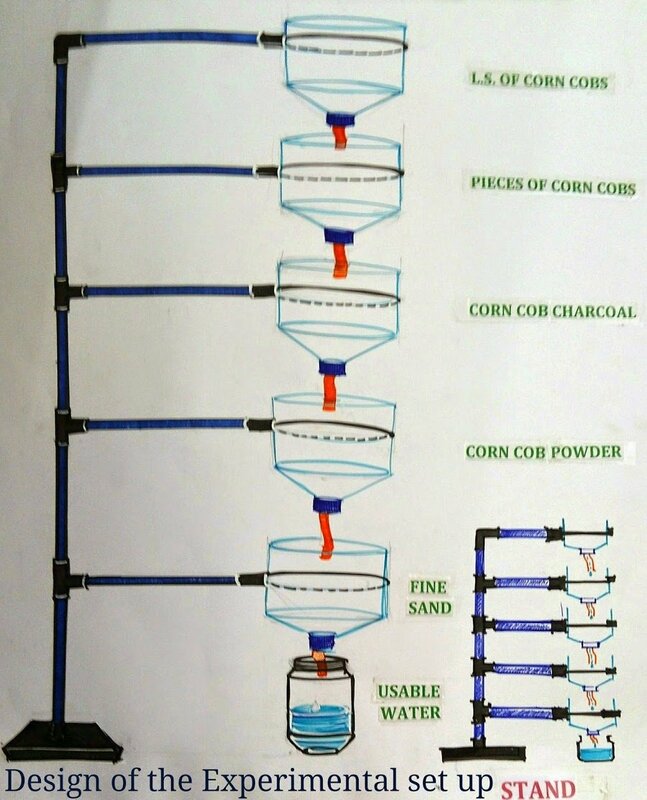 "If the drain pipe of household is connected to a chamber having different layers of corn cobs in partition layers or to an S-trap pipe having corn cobs, it will separate about more than 70-80 % of contaminants including suspended particles from the waste water. Similarly, the factory outlet pipes carrying effluents must be opened to five inter-connected chambers having long slices of corn cobs, pieces of corn cobs, powder of corn cobs, activated charcoal of corn cobs and fine sand for the easy adsorption of TSS and chemical toxicants, both organic and inorganic." Prasida also says that corn cobs can be used to clean water bodies like ponds and rivers, along with tanks. The website says, "Corn cobs fitted to bamboos buried on the ground floor of the ponds and allowed two to three weeks to stand can be useful for cleaning of water in ponds, tanks and rivers. This is also useful to clean overhead water tanks of individual households and community tanks." 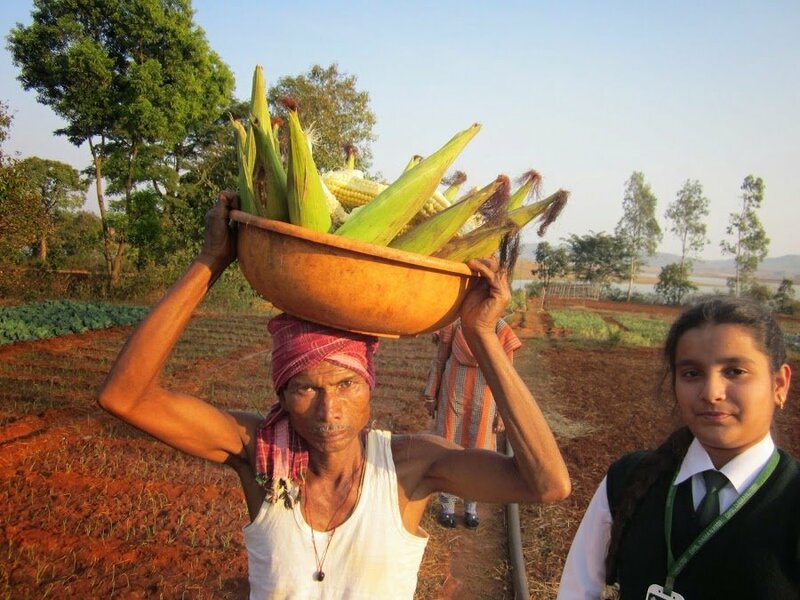 While corn cobs are widely available as an agriculture biowaste, Prasida says more chemical and physical examinations are needed for their commercialization for water purification. Prasida's interest in science was sparked by her encounter with a tribal farmer who informed her about the low utilization of corn cobs. 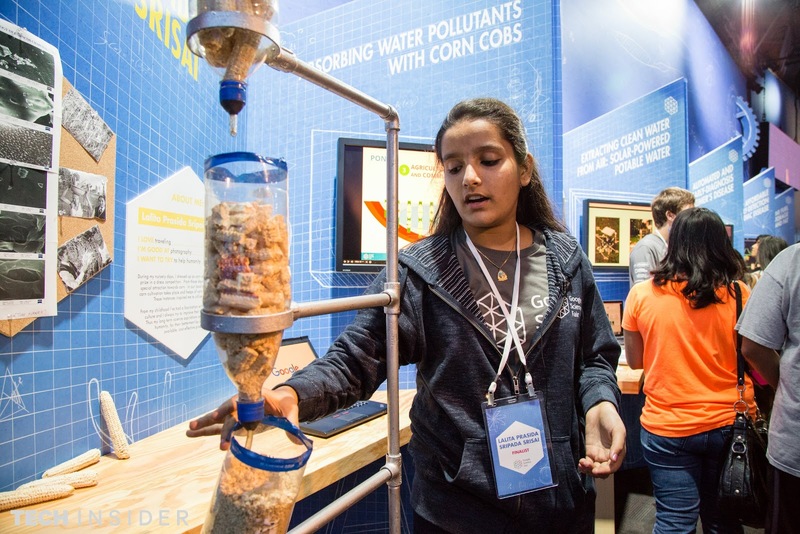 This began her journey to find out more ways to use waste corn cobs.